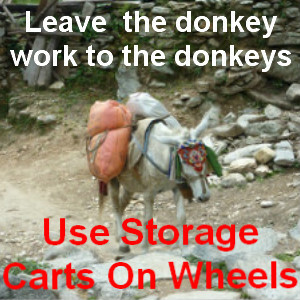 Funny how ideas just keep growing and that has been my experience when building this list of storage carts on wheels. It all started out with me searching for something that would store all the tall gardening tools that I was constantly tripping over in the shed. My search certainly was fruitful because not only does this item store my tools, I can also wheel it around the yard using from the rack what I require and place it back into its slot when finished. No more dangerous tools laying around the home and garden waiting to cause an accident. Well that was just the start, as my sister who is always busy, asked me to try and find something that would keep her young granddaughters hobby workstation a bit tidier. Yep you guessed it, it’s now added to the growing list below. If you have other ideas of wheeled storage carts that would help build the list, leave a comment and we will add it on here. The search I was doing was uncovering numerous useful ideas and some we ourselves have gone on to purchase. We never even realized that there were such carts around that would ease the burden of carrying things around. When you see what commercial companies, hospitals and such places use to move their goods around, it makes sense to bring some of those carts on wheels into the home environment. 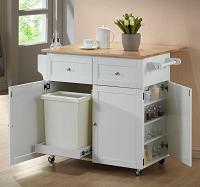 The kitchen is just one area where carts are commonly used today. Preparing food and disposing of the scrap cuts can be done much easier when a kitchen cart with trash bin is used. 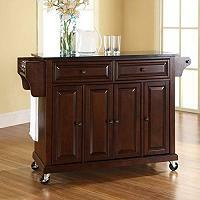 It can be moved around the kitchen to the best spot to work or even used to cart food to the dining area. Another great idea for storage which couples up as an extra worktop is the granite top kitchen cart and if you need that extra bit iof space takke a look at it. Whether you’re attending trade shows, delivering goods, shifting heavy plant pots around in the garden or simply moving items around the home, you should find something here that will make life that bit easier. Do you think that the garden storage cart on wheels is an improvement on the alternative of these tools lying around loose? >Make life that bit easier with these gardening storage carts on wheels, while carrying out those garden chores. I don’t know how I managed to get along prior to getting my hands on one of these, they’re so handy. Keep your tools better organized in a safely stored manner with this space saving portable tool store. How many times have you watched a comedy clip where the unfortunate person steps on a rack and the handle comes up and smacks them on the face? Things were fine when I only owned a very small collection of gardening tools. As generally happens this collection soon grew into a tangled mess that no matter how well I stacked them, often as not they would come crashing to the ground. Now my cart is always by my side when caring for whatever part of the garden that needs tending, while at the same time, everything is to readily to hand. >These bright and colorful Advantus 10 drawer rolling storage carts can do more than just store items. Office spaces can be dull and boring for those working in these types of environments and many people are turning to the idea of brightening these spaces up. Not only for themselves, but also for their employees, which is no bad thing. The storage carts with drawers over there on the right, are just one such idea that could be put in place to solve the storage problem and add a bit of color at the same time. 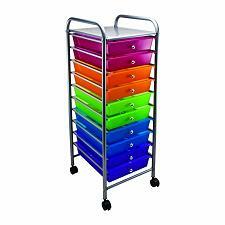 This brightly colored 10 drawer storage cart on wheels will brighten up any dull area of the home or office. With the caster wheels fitted, it makes this a very portable storage area that can be moved with ease from room to room if you so wished. The measurements of the chrome metal frame which houses the drawers: 37.6 inches high, by 15.4 inches deep and 13 inches broad. In order to stop the 10 drawer stack from moving around once they are in situ, two of the casters which swivel, can be locked to prevent movement and accidents. 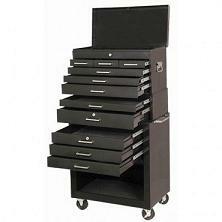 Apart from the 10 drawer multi colored sets, Advantus also provide them in all black. Also choose other numbers of drawer combinations. Reviews state that it’s not wise to overload the drawers with heavy items as they would buckle under too much weight and would suit lighter use. Are you crying out for such an idea? Are you aware that such an idea exists? How would your kids react to being presented with the answer to ending untidiness? Do you think these units might just train them in an unconscious manner, about how putting things back where they belong is a good idea? Back where they belong so that they can easily put their hand on it the next time they need to use it keep all your bits and bobs together in these craft storage carts on wheels. Avoid the problem of hunting for that certain item to complete a project, when you have everything to hand in your cart. The storage in the unit is available via, shelves plus red bins located in the unit and in the stool. 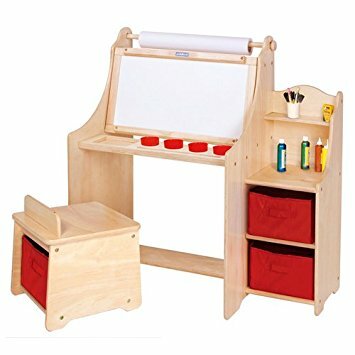 Add to this the chalkboard on one side of an easel and a write-on/wipe-off on the other plus a roll of paper for the kids to draw and paint on. Paint cups and their holders are also included to allow the kids to carry out some constructive art. As for the sizes, they are really big enough to suit any adult even who has a need for a tidy workstation. Measuring, 36 inches Long x 24 inches Wide and 39 inches High and has dividers that slide to accommodate tall lengths of colored paper. If you would feel a lot safer having a cabinet that you could lock away paints and the like, another option from this company might suit you better. Or even as an add on. They actualy term it as a Media Cabinet but it would also make a great art activity cabinet as it is lockable. Take a look at all the details here. e wire carts on wheels are a great idea that helps to keep the weight down to a minimum, while at the same time are strong enough to carry and store a lot of items. The five tiered shelf system provides you with plenty of space and is strong enough to take a load of up to 50lbs on each shelf. See full details here. Moving batches of clothing etc, is a breeze due to the caster type wheels. 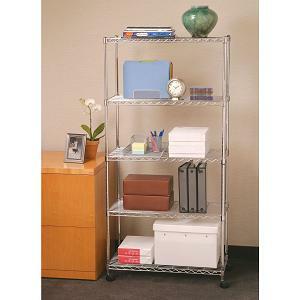 The wire carts would be suitable for commercial / industrial use as well as for the home. Assembling the Wire Cart is a breeze as no tools are needed to build this Zink plated steel storage structure on wheels. The measurements are, with the wheels attached – 60 inches High, 30 inches long and 14 wide. Reviews for this wire cart with wheels are very good, with lots of positive comments. The rating from the 320 users is an average of 4.6 from the 5 stars possible total. g favorite among mechanics and industry in general is the 10 drawer rolling storage cart with locking drawers feature. Great for keeping all your tools in one handy safe place where you can find them, saving time hunting for them for each job that needs to be tackled. Yes the 10 drawer tool carts sure looks pretty, only thing is, the price tag just isn’t as pretty. Granted they are made to the highest specs and will last for many decades trouble free, providing that is your number one requirement. See it here. But I have found an alternative for anyone who would like to own one of these storage cabinets on wheels but simply can’t afford the real thing. Enter the 11 drawer rolling cart which you could have for a fraction of the cost of a 10 cart version. View more details here. 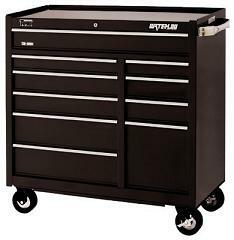 Don’t get me wrong here, if you’re in a profession that would be in and out of one of these tool drawers all day and every day, then the professional 10 drawer version might suit you better. Thing is, for the general home handy man who would only be using the 11 drawer roller tool cabinet only on a few occasions a month, it might just do the job for him. So it’s purely horses for courses with these storage drawers on wheel, each to their own. o below describes some of the features of the 11 drawer tool chest. For more similar items click the link below. u have it, my selection of storage carts on wheels; hope the above information has helped you find what you’re looking for. Maybe even given you some ideas for Christmas presents you could give, or you would like to receive. Anything else you would like to be added to the review, just leave a comment and we will try to oblige! 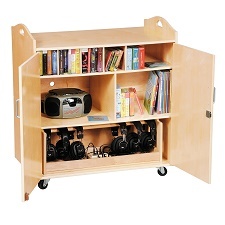 what is the price listing for the art activity storage cart and do the doors have locks on them? Hi Joelean, the art activity storage cart has now been discontinued by the manufacturer. I don’t the reason why because it was an ideal piece of equipment and well suited for its purpose. However I have done further research and come up with other options. Since you asked if the original art storage cabinet doors locked, I suspect that this maybe an important feature to you. If so, I have added a cabinet in the post which indeed has locking doors and although not created as an art storage cabinet, I it would serve the purpose very well.